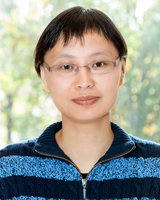 Dr. Qiang Le received her Ph.D. in Electrical and Computer Engineering from Georgia Institute of Technology in May, 2006, S.M. in ECE from Gatech in 2004, and B.S. in EE from Beijing University of Aeronautics and Astronautics in 1995. She also obtained S.M. in Computer Information Science from Clark Atlanta University in 2002. She is a SUN certified TM2 JavaTM 2 Platform Programmer since 2001. In August 2006, she joined Hampton University as an assistant professor in Electrical Engineering. Army Research Laboratory Cooperative Agreement Award # W911NF-09-2-0041: Low Complexity Track Initialization and Fusion for Multi-Modal Sensor Networks. NSF EEC Award #0934760: Collaborative Research: Development and Testing of Presage-Pedagogy-Process-Product Model to Assess the Effectiveness of Case Study Methodology in Achieving Learning Outcomes. L. M. Kaplan and Q. Le, "On exploiting propagation delays for passive target localization using bearings-only measurements", Journal of Franklin Institute, Mar. 2005, vol.342, pp193--211.